Stepping up to the scales at 1 501 kilos (3,310 pounds), the 1937 Packard Six Touring Sedan for five passengers cost $1,430 f.o.b. Windsor, Ontario. Packard got its start in 1899 after an incident in which unhappy Winton owner James Ward Packard spoke personally to Mr. Alexander Winton and proposed improvements to the Winton automobile. The rather arrogant creator told Packard his creation was impossible to improve. That exchange prompted Packard to prove Winton wrong by building his own automobile. His Ohio Automobile Company was renamed the Packard Motor Car Company in 1902 and shortly thereafter moved from Warren, Ohio to Detroit where its new home was a state-of-the-art factory designed by fabled industrial architect Albert Kahn. Packard quickly graduated from single-cylinder vehicles to twins and fours. Within a decade the company had established itself firmly with the public as a maker of fine luxury automobiles, many with custom coachwork by prestigious design houses. The six-cylinder Packard appeared in 1911 and the Twin Six or 12-cylinder Packard in 1916. Targeted to the world's wealthy, Packard was one third of the "three 'P's", Packard, Peerless and Pierce Arrow. The toney triumverate offered cars fit for royalty, presidents and prime ministers in catagories far above domestic competitors Lincoln and Cadillac. The introduction of Imperial Preference and Empire Content laws gave substantial tax breaks to manufacturers producing goods within the British Empire. It effectively shut out American companies by use of a stiff, 35-percent tariff. American automakers that had previously exported to Canada and other parts of the Empire opted to open assembly plants in the Dominion of Canada. Most companies chose to locate their Canadian subsidiaries in Windsor, Ontario--a stone's throw away from Motor City--Windsor lay directly south of Detroit, on the south side of the river Detroit. The new Canadian address made them domestic players and that gave them full access to the vast British Empire market. Packard chose to open its assembly plant in Windsor, Ontario in 1931. The first Packard to roll out the factory doors was festooned in a Union Jack. On hand for the auspicious occasion was Alvin Macauley, president of Packard’s worldwide operations, the mayors of Windsor and Sandwich, as well as the publisher of the Border Cities Star. At the Prince Edward Hotel, Packard threw a reception where Macauley placed the hubcaps on the Packard to complete its assembly. Domestic sales reached 216 units during the company’s first year in Canada. In 1932 Packard offered cars ranging in price from $3,920 for the distinguished five-passenger phaeton to $6,850 for the sassy five-passenger convertible Victoria. The economy was in the dumper and domestic sales hit a low of 109 units. Surprisingly the assembly plant did not close. Sales rose to 139 units in 1933. Sales of Packards in Eastern Canada tumbled to 115 units in 1934. The economic picture looked much brighter with sales of 659 units in 1935 with the introduction of the new, smaller Packard 120. The decision turned out to be a wise one. Records indicate a healthy 1,476 units delivered during the 1936 calendar year. Assembled in Windsor, Ontario, the 1937 Packard Six Sport Coupe listed for $1,330 and weighed in at 1 458 kilos (3,215 pounds). If one good turn deserved another, then the 120 was the perfect manoeuvre from which to introduce the new, even smaller and more affordable Six. The Six was offered in eight models on a pert, 2 921-millimetre (115-inch) wheelbase. The least expensive was the two-passenger Business Coupe with its list price of $1,260 while honours for the most expensive automobile in the series was shared by the five-passenger Tour Sedan and the four-passenger Convertible Coupe at $1,430 each. At 1 490 kilos (3,285 pounds), the 1937 Packard Six Convertible Coupe was the heaviest in the 120 series and with its $1,430 price tag. It was tied for top honours with the Five –passenger Touring Sedan as the costliest of the small Packards. Under the hood loafed the two-litre (282-cubic inch), 100-horsepower L-head six fitted with aluminum pistons. The power was fed to a three-speed, silent, synchronized manual transmission. Cabins were capacious and beautifully appointed as one might expect in such a prestige vehicle. Steel bracing was strategically reinforced with select hardwood. Narrow A-pillars combined with a 33-centimetre (12-inch) tall safety glass windshield that offered extra vision in all directions, and was convenient for watching the new overhead traffic lights. Front doors were now hinged from the trailing edge of the hood and fenders for safety and convenience. A novel sponge rubber seal completely encircled each door to shut out wind and inclement weather. Instrument panel of the 1937 Packard Six was symmetrically balanced. An accurate electric clock was optional equipment that replaced the Packard shield on the right-side circle. The instrument panel was described as being “attractively useful.” Dials were large, nicely balanced and illuminated with indirect lighting to provide “sure night vision without eyestrain.” The over-wide seats carried a distinctive style of plain pleating to add to their tailored trim look. Advertising noted that orthopedic contouring made them “as comfortable as they look.” Floors were flat and the rear passengers enjoyed a nifty footrest built into the back of the front seat. 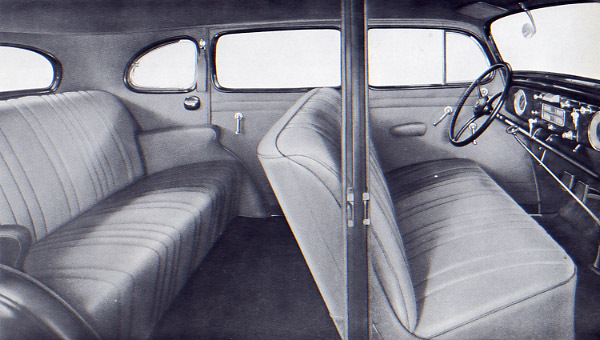 Interior of the 1937 Packard Six Five-passenger Touring Sedan was as posh as any other Packard in the lineup. The company boasted that the Six carried 46 ball and roller bearings, “whose lavish use helps make the new Packards the most service-free cars to bear the well known Packard name.” Fine touches like those made the car worthy of the Packard name. The 1937 Packard Touring Coupe carried a price tag of $1,360 and like all other models in the domestically built Six series rode on a 2 921-millimetre (115-inch) wheelbase. All Packards came with an oil bath cleaner, a roll control bar, jack pads, a spare wheel, a jack and tool equipment, body ventilation, an interior sun visor, two windshield cleaners, a rear view mirror, front and rear ash trays, a spring-loaded robe rail, a rear foot rest, a generator voltage regulator, 344-lux (32-candlepower) headlights with four lighting positions. A combination tail and stop light, a horn, speedometer, a gasoline gauge, an oil pressure gauge, a motor thermometer, an ammeter, a locking package compartment in the instrument panel, a wheel compartment lock, a cowl ventilator with screen, an adjustable front seat, toggle grips and a radio aerial in all cars with enclosed bodies. Accessories included an accurate electric clock; a radiator emblem “sculptured in modern style as a streamlined symbol of grace, speed and beauty;” chrome trim rings; a flexible steering wheel; a hot water heater with or without defroster and a radio. 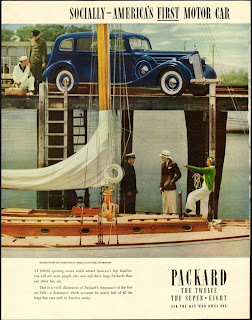 It would turn out to be a good year for the folks at Packard. The sales tally for 1937 would be a notch up from the year before as 1,168 Packards of all stripes were recorded for the 1937 calendar year.